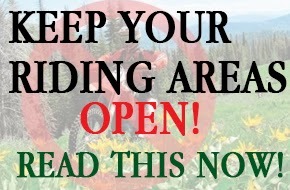 SGC News Hub - Alberta Off-Road News: Alberta Land Use in Final stages, ACT NOW! Alberta Land Use in Final stages, ACT NOW! Please take a read and fill out as much as you can on these questionnaires for the Government of Alberta. You do not have to fill completely and all questions and concerns are needed. Keep our riding areas open for generations to come! We are now in the final stage of collecting feedback for the draft South Saskatchewan Regional Plan (SSRP), which lays out the path for managing growth pressures and balancing environmental needs in southern Alberta. The regional plan will create new conservation areas, establish environmental limits, protect our water supply, and provide clarity about land use and access. We encourage you to review the draft regional plan and provide us with your input via the online workbook or discussion guide. Your submission of one of these documents must be received electronically or by mail by February 28, 2014. The online workbook and discussion guide are available from the Land-use Framework website at www.landuse.alberta.ca . You may also submit your feedback via email to LUF@gov.ab.ca. Your input and comments are essential as we work to develop the final regional plan for southern Alberta. Summaries of the feedback gathered throughout the workbook and consultation sessions will be publicly released. To read up on what we’ve heard about the SSRP thus far visit our blog at www.aesrd.wordpress.com/category/ssrp/. Thank you for your continued support as we work to achieve Alberta’s long-term economic, environmental and social goals. 9th Fl. 10035-108 St. Centre West Bldg. This is our land, and it’s up to us to ensure the aspects of this province that we enjoy are there for current and future generations.